"In John D. Mitchell's Lost Mines and Buried Treasures Along the Old Frontier there is a chapter entitled "Don Joaquin and His Gold Mine" that describes the mine and stone house fairly accurately, and adds a few elements of pure fantasy. In short, Mitchell writes about a mine deep in the heart of the Estrella Mountains there was a mine worked by Indians and belonging to a certain Joaquin Campoy of Guadalajara, Mexico. In 1847, as the American Army approached the Maricopa region, Don Joaquin decided to grab his gold and run, supposedly loading 3,000 pounds of gold on 15 mules. Heading south, he buried the gold, killing his sole companion, an old Maricopa Indian, to guard the secret of his buried treasure. Soon after this Don Joaquin was himself murdered and a map - there has to be a map, of course - fell into the possession of a miner who took it to Mexico. No one ever returned to claim the treasure and it still lays under a thin layer of soil in the back of a cave near Montezuma's Head. If the little stone house was built early in the 18th century, then it is probably the third oldest standing structure built by the Spanish in Arizona, after the missions at Tumacacori, in a state of ruins, and San Xavier del Bac, still standing magnificently. That would probably make the little house probably the oldest non-religious building surviving from that era - and within a few miles of Phoenix. Is it possible? Only in the Sierra Estrellas." Intrigued by this information, a group of Friends decided to attempt to locate this piece of Arizona history. 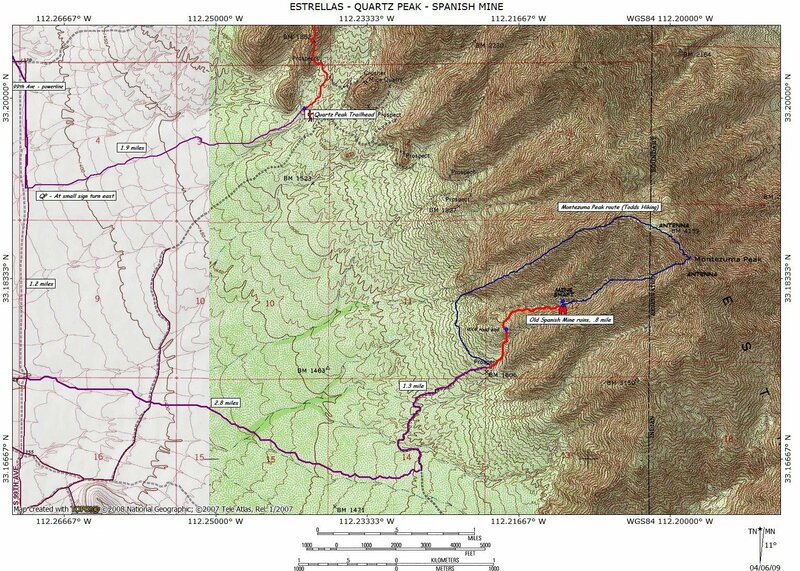 Additional internet searching found reference to an old rock house ruin on the Estrellas western slope below Montezuma Head, the range's highest peak. We decided to first hike Quartz Peak, about 3 miles to the northwest as the crow flies. Quartz Peak is always a challenge, and is well written up elsewhere on HikeArizona. After everyone completed the hike and ate lunch, our mine search began. The roads to the base of Montezuma Head are accessible by high clearance vehicle, but be prepared for new pinstripes! Additionally, one can drive further using a 4x4, but heck, we ARE hikers! Parking at a wide area at the mountain's base, we followed an old mine road which was put in during the 60s to the ravine below Montezuma Head. Here a faint trail can be found heading east. Questions enters our minds; Does this lead up the mine site? If so, how far is it? Following the old path up the south side of the wash, one must pay close attention, as it fades in and out. You can tell it's an old trail, but it's overgrown in places. Just keep working your way up the hill. The further you go, the more faint the trail becomes, leading to more questions; How much further is it? Will we run out of daylight? Will the beer still be cold when we get back? Further up the path we climbed, scrambling around brush and rock. Finally we found the remains of an old rock wall. Is this one of the clues mentioned at sierraestrella.com? We continued further up the faint path, finally reaching a point to where I said 'I think Don Joaquin's mine remains lost!' But one of my companions said he was going another 75 yards or so, then yelled 'Well, here it is!' The old stone house is practically invisible until you are right on top of it, and is about 1 mile up the trail, located at 33.18082,-112.21182. A small structure of about 5x6 feet, it's roof is mostly missing, but it's walls remain strong. Inside there is a small glass jar with a note pad inside to sign. Note the pad's about full, and needs replacing. Better yet, an ammo box! Outside the stone house is the remains of an old water cistern, lined with rock. Yet further up the wash is the mine itself, tunneling straight down into the ground, located at 33.18123,-112.21182. Does the stone house and mine date back into the 1700's or 1800's? Who knows. Perhaps someday an expert from ASU will study the site. Until then, it will remain the Legend Of Don Joaquin's Lost Spanish Mine. From Phoenix head west on I-10 towards California. Take the Estrella Parkway exit and head south. Continue 8.2 miles to Ellitot Road. Take a right and follow 2.6 miles Rainbow Valley Road. Take a left and follow 9.3 miles to Riggs Road. Take a left and follow 3.9 miles to Bullard Ave. Turn right and immediately turn left onto a dirt road. Continue on the dirt road following the power lines for 5.3 miles passing Rainbow Rancho along the way. At 5.3 miles is the turnoff to the Quartz Peak Trailhead. Continue straight (south) for another 1.2 miles and turn left (east). Follow this somewhat rougher dirt road 2.4 miles, then turn left (northeast) on an even rougher, rockier road about 1 mile and park.